Want a house plan that's customized, energy efficient, and affordable? A house plan is one of the most critical documents that you will need when building your new home. Here at Wise Home Design, we understand that building a home is a daunting and exciting task. We've built our own homes, too, and know firsthand the stress—yet also the excitement—that building your own custom home can bring. We know you want to be proud of your home...to have it fit your needs to a "T"...for it to be energy efficient...and you need it to fit your budget. We've compiled information from experts with experience building and designing homes that are both energy efficient and affordable. House plans are the place to implement and plan out how you want your dream house to look and function. So that means you have a large, but vitally important, task: research and explore what options are available to you. Our draftsman designs custom house plans to meet your specifications. The plans highlighted on the site provide you with a good idea of the quality and integrity of our work. In addition to planning, we also provide information on building materials and techniques. We have designed and built homes in several locations around the country and have discovered that every home has its unique challenges. These challenges have taught us that by doing research before committing to a product or service frequently pays big dividends with the finished house. Some technologies have yet to come into their prime. For example, most active solar systems are still expensive and somewhat inefficient. The available tax credits and advances in battery technology help to increase the practicality of these systems. 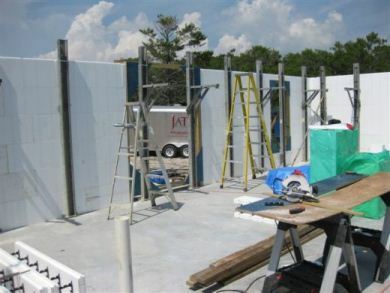 Other innovations such as insulated concrete forms (ICFs)—shown in the photo above—are more straightforward in their approach to efficiencies and as such are quicker to show financial returns. 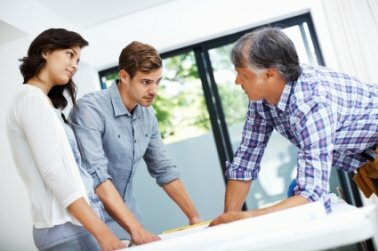 So by being an informed homeowner you have the luxury of gaining knowledge from other people’s experiences instead of reading a slick sales brochure that is meant to sell you a particular product. In addition to planning new construction we also have a depth of experience upgrading and renovating existing homes. This type of planning and construction has been growing in popularity as the housing market has slowed. House renovations can range from small upgrades to large multifloor additions, so there is a lot of information to be aware of before tackling such a project. Identifying the best products for the job can save an enormous amount of time and money, so be sure to check out our various reports on such items as windows and cabinets. This site is a continuously growing body of work that will supply you with current information on planning, building, and renovating your home. Please be sure to fully explore all the site has to offer and share the info with friends. Is a Tornado-Proof Home Possible?